No matter what form they’re in, cinnamon rolls are pretty much my kryptonite. Before I learned to bake, Shane and I would buy the ones that came in the tube and eat them not as breakfast, but as a Sunday afternoon snack while we watched football. It’s almost more dangerous now that I can make them myself any time I want. There are always treats sitting around our house, at least for a day until I can send them off to work with one of our parents, or Shane, and as a general rule, it’s not hard to resist them. That is so not the case with cinnamon rolls. I am powerless against the aroma of a freshly baked cinnamon roll. It’s pure torture walking around Ikea if I happen to be there early in the day 🙂 That fresh from the oven light, fluffy texture – don’t even get me started. Needless to say, I only allow myself to make them a few times a year now. I fell in love with the idea of these cinnamon rolls even before I recently became obsessed with grapefruit. It was one of the first recipes that caught my eye as I flipped through The Homesick Texan cookbook after opening it on Christmas day. I was intrigued by the addition of not only grapefruit zest, but also lots of juice to the dough. While the filling included the traditional cinnamon and sugar combo, there was also grapefruit zest. And to really drive home the point, more grapefruit juice and zest in the icing. I didn’t know if I’d like it, but my curiosity won out. Sweet and salty works, why not sweet cinnamon and tart/tangy citrus? After nearly 3 months of waiting, I finally gave in and made these, and I’m so glad I did. They’re not unlike the other cinnamon rolls recipes I’ve loved – the rolls were really tender, with a gooey filling and sweet icing on top. But there was also a little something extra too. Sometimes when you taste something you can’t quite put your finger on it, but you know there’s something else, something unexpected in the recipe. That’s exactly how I felt upon trying one of these cinnamon rolls. If someone else had baked these, I don’t think I’d have guessed that something was the tanginess of the grapefruit. I even managed to restrain myself and only have two before sharing the pan of them with someone else, so I’d say it was a win all around! To make the rolls: In the bowl of your stand mixer, combine the yeast, water, grapefruit zest, grapefruit juice, sugar, salt, egg, butter and 1 cup of the flour. Stir with a wooden spoon until a lump batter comes together. Add the remaining flour and mix (still by hand) until a soft dough comes together – it may be sticky, that’s fine. Cover the bowl with plastic wrap and let the dough rest for 15 minutes. Fit the mixer with the dough hook, and attach the bowl. Knead the dough on low speed for about 5 minutes, or until it is smooth and elastic. The dough will probably stick to the bottom of the bowl, but should clear the sides as it is kneaded (if necessary, you can add a little more flour). Turn the dough out onto your work surface and shape it into a ball. Place in a bowl that’s been sprayed with cooking spray, cover with plastic wrap and let rise until doubled in size, about 1 1/2 hours. Spray a 9×13 baking dish with cooking spray. In a small bowl, mix the sugar, cinnamon and zest together for the filling. Turn the dough out onto a lightly floured surface. Roll it into roughly a 9×13-inch rectangle. Spread the butter evenly over the surface of the dough, then sprinkle the cinnamon mixture over the top. With a long side facing you, roll the dough into a tight cylinder, pinching the ends to seal. Cut 14 or 15 1-inch slices from the cylinder and transfer to the prepared baking dish. Cover the pan and let the rolls rise for an hour. While they’re rising, preheat the oven to 375 F. Bake the rolls for 15-20 minutes, or until golden brown. While the rolls are in the oven, make the icing by whisking together the confectioners’ sugar, butter, grapefruit juice, grapefruit zest, vanilla and salt. Transfer the pan to a wire rack, and while the rolls are still warm, spread the icing over them. The rolls are best shortly after they’re made, but you can pop them in the microwave for 10-15 seconds the following day to refresh them. 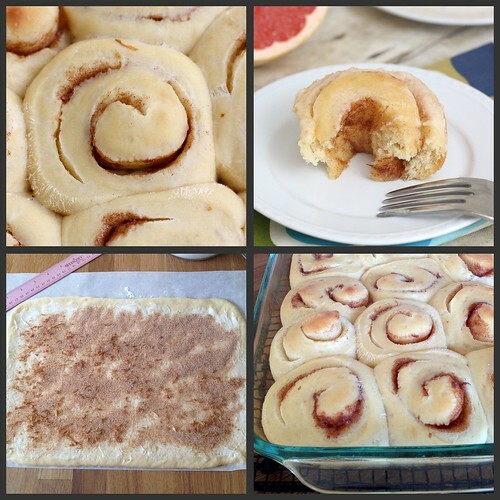 23 Responses to "Ruby Red Cinnamon Rolls"
ahh you’re killing me with grapefruit recipes!! this looks so delicious! i love how puffy and fluffy they are. i need to get on this cinnamon bun train! I love cinn rolls and just posted about some yesterday. These sound AMAZING. Grapefruit…who woulda thought! These look great, and such a fun fresh twist. Shawnda is such a pusher, glad she’s converted you too! Oh yes, cinnamon rolls are dangerous. What a great flavor addition! 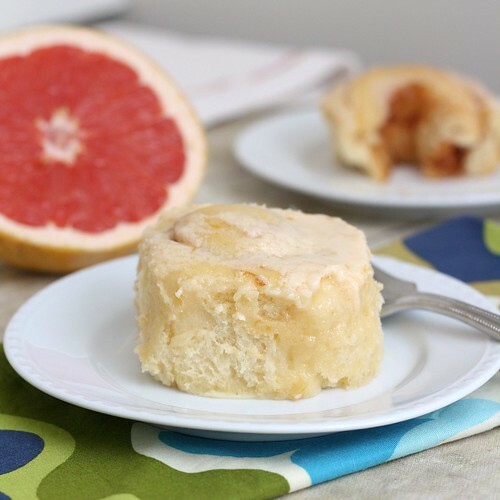 I adore a good orange roll – but Grapefruit takes it to a whole newlevel!! Amen! Your rolls look great! I’ve been wanting to make cinnamon rolls again, but have been waiting until I get my KitchenAid fixed. I may have to make some by hand. I need to try to make cinnamon rolls again. My previous attempts have always been just so-so. I love the addition of juice in the dough and may try it with oranges! I’ve had a broiled grapefruit half with cinnamon and sugar on it in a restaurant, and the cinnamon/grapefruit combo is really tasty. In cinnamon roll format, I’m sure it’s even tastier! This is very new recipe with grapefruit, definitely will give it a try and book marked. Love the addition of grapefruit, it must be delish! What a fabulous addition to spike up cinnamon rolls. Love it. Wow this looks and sounds amazing! I have trouble thinking about sharing cinnamon rolls too. I’ve never made them with grapefruit before though…definitely something to try! This looks delicious. So many rolls and buns are being shared. There really is nothing like a freshly baked cinnamon roll. They’re a weakness for me, too, and I avoid baking them for the same reason. I think I have to try these, though. I love the idea of a subtle tangy flavor in them. Cinnamon rolls are always dangerous around here too. There’s no denying it. After I spend the time making them, I am definitely having one (or several). These look like a fun twist. I have been saving all your grapefruit recipes in anticipation of our grapefruit tree doing really well next year! Grapefruits yield one of my favorite flavors and I have this cookbook sitting on my shelf! I’ll have to try these out! These rolls were delicious..moist with great cinnamon flavor! I really liked the addition of the grapefruit. Thanks for sharing with us! I’ve made cinnamon rolls with eggnog and with pumpkin, but never would I have thought of grapefruit. As a fellow-grapefruit-obsessor, this recipe is going right on my list! @tmcc4 – I’ve never used a bread maker, so I’m not entirely sure. Sorry. I’m also powerless over cinnamon rolls. Which is why I’ve never made them. Whenever I’m in an airport with a Cinnabon it takes every ounce of restraint not to give in to that heavenly cinnamon sugar aroma. I’m intriqued by the addition of grapefruit. Your rolls look beautiful. One of these days I’ll give in and make homemade cinnamon rolls.